In–store kiosks have become a trend and continue to gain popularity as they cut down on costs and help businesses provide better services. In-store kiosks certainly speed up the pace of the transaction; however, businesses that include a human agent with kiosks incur more ROI. Why does this happen? A self–service kiosk only does as directed, whereas, an online agent can address specific needs and requests of the consumer, making them feel secure. The technology of an in -store kiosk has seen significant expansion as shoppers gravitate towards convenience and efficiency. As this trend continues to grow, it is essential to understand how this technology impacts consumer behavior in ways that not only magnify a retailer’s ROI but also improve customer satisfaction. In-store kiosks, along with direct agent support, provide a higher level of convenience and accuracy. With personal support from an online agent, the customer not only transacts faster but also develops trust and loyalty towards the business. 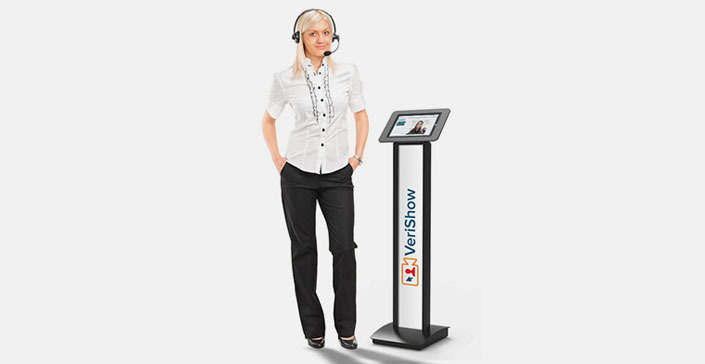 According to, “Virtual concierge offers VIP customer service”, with advancements in video conferencing quality and the proliferation of personal internet connected devices, the possibilities of what can be accomplished with virtual concierge kiosks are seemingly endless. When a consumer faces a problem even while transacting with a kiosk, the online agent can immediately provide support and guidance through applications like Video Chat. This helps in reducing the overall time a consumer spends at a store. Providing improvements in ordering can increase the total order volume and lead to an increase in sales and conversions. Since in-store kiosks are more common now than ever before, the pricing of products continues to fall. This makes kiosks more accessible to smaller companies, thus allowing them to grow. According to 2015: The rise in In-Store Kiosks, Kiosks are gradually becoming the bridge between online and brick and mortar retailers. Additionally, self-service Kiosks support delivery of information through various channels and help the consumers to retrieve necessary information from each channel easily. Why do self-service technologies change how a consumer behaves? There are a number of reasons as to why self-service kiosks change the way a consumer behaves. The foremost reason is that a self-service kiosk never fails to upsell. Another common factor that causes consumers to trust more is the constant support from a company agent. Customer Service Strategy: Deliver Value with Time states that customers turn to an online alternative rather than having to make a call and be put on hold, transferred to numerous people and have to repeat their story multiple times. Therefore, the use of in–store kiosks not only improves sales and conversions. In-store kiosks are a popular way for retailers to provide better service at a lower cost. Also, the combination of in–store kiosks and human agents results in accuracy and better customer engagement which leads to happy and satisfied customers.